A few months ago there was a update in webcore. After the update I seem to have lost the Device status information in the webcore terminal. It hasn’t proven to be a big deal because everything still seems to work correctly but it would be nice to have that information again. Photo attached and highlighted issue in yellow. The issue is on all of the devices. Any suggestions would be helpful. These showed up today. 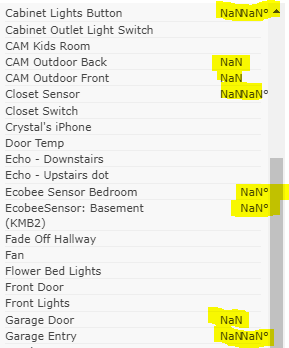 Back Door Sensor NaN°NaN . It’s on several of my devices in the right hand column device list. That makes sense thanks for letting me know. I thought it might have been something to do with the way I updated webcore.